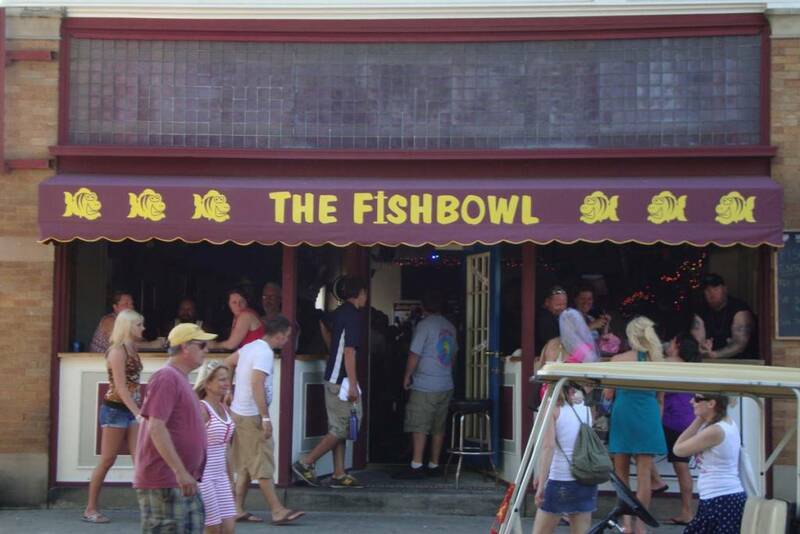 The Fish Bowl on Put-in-Bay is a favored hangout among visitors. The building was extensively renovated, providing guests with a comfortable and cozy environment. Moreover, the expanded deck on South side of the building affords wondrous views of downtown Put-in-Bay. Mossbacks is directly next to the Fishbowl. The Valentine Doller building is home to both of these establishments. Valentine Doller is a past resident of Put-in-Bay who came to the island in the mid 1800’s. Moreover, during his time on the island he held many positions. Surprisingly, he was the first postmaster, the clerk of courts, a founding trustee of the Village and even the mayor. This structure that bears his name is situated on Catawba Avenue. Also, the beautiful DeRivera Park is across the street. Additionally, the Jet Express ferry terminal is just a short walk away. The Fishbowl is a fun, quirky bar with a great staff. So, be sure to stop by and say hello to Kayla. Oftentimes, she is at the helm mixing up a variety of tasty options. All of the fun will likely work up an appeitite. Fortunately, they have a great food menu. The variety of the food menu is impressive. Appetizer selections include Lake Erie Walleye Nuggets, Sauerkraut Balls and Potato Cakes. Also, they have Chicken Fingers and Onion Rings to suit the younger crowd. Dinner options include Lake Erie Walleye and Perch baskets, as well as hearty steaks. More importantly, the menu features the legendary burgers of Mossbacks. There are several different options. However, the only difficulty will be on choosing one! A trip to Put-in-Bay and the Lake Erie Islands is very worthwhile. The history, charm and beauty of the island has kept visitors flocking for generations. Moreover, guests often remark how they feel at ease while on the island. Therefore, this is a special feeling that must be experienced. Plan your trip today!